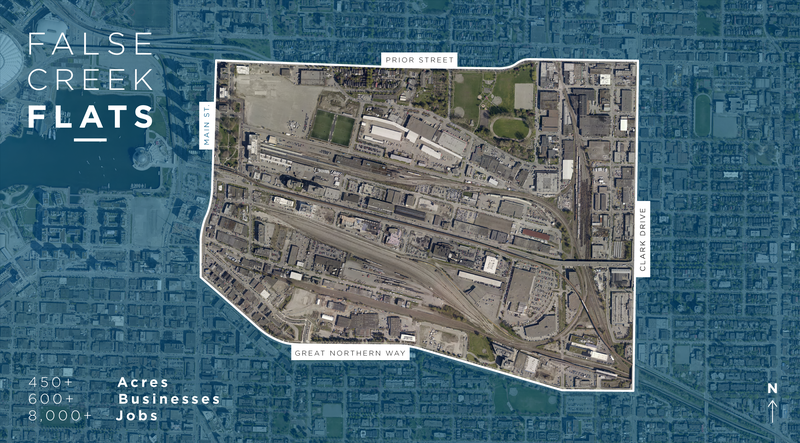 The Flats plays a vital role in Vancouver’s local and regional economy. The Flats contains more than 600 businesses and 8000 employees. It represents 10% of Vancouver’s wholesale, manufacturing and waste management jobs. Employment is expected to triple in the next 15 years, bringing significant economic opportunity to the district. For instance, new institutional anchors, including a new hospital, university campus, and district energy utility create opportunity for expanding clusters in health, the arts, and the green economy. increased employment density can also help sustain the amenities and social spaces needed to develop an innovation district. Increased employment density, however, also creates new challenges for the Flats, including increased competition for space. The Flats makes up 15% of Vancouver’s industrial land base, and demand for centrally located industrial space in Vancouver is outstripping supply, reducing the vacancy rate for industrial space in Vancouver to 1.2% in recentyears. Competition for light industrial space is creating an affordability crisis that threatens the prosperity of the region. Between the summer of 2015 and the summer of 2016, industrial land values rose by 50% in the Flats while the industrial vacancy rate dropped to 1.2%. This competition for space and associated leaps in land value are now threatening the viability of industrial uses on industrial land. The Economic Development Strategy for the Flats has been developed to balance the opportunities and risks associated with employment densification in the Flats. This strategy demonstrates how the Flats can serve as both a thriving industrial district and a dense innovation district, an anchor for key economic clusters and a demonstration district for emerging approaches to sustainability and resilience. Four key sustainable economic development opportunities were identified for the Flats though extensive engagement with the local business community. The Flats can play an integral role in shaping the way Vancouver manages materials, featuring circular economy business models, eco-industrial networks, and a diversity of deconstruction, recycling and reuse facilities. The Flats has the potential to become a powerful centre for smart logistics, featuring a variety of clean distribution solutions from alternative fueling infrastructure for return-to-base fleets to software that improves delivery efficiency and reduces vehicles on the road. The Flats are ripe for building retrofit and renewable energy projects. Given the size and age of buildings in the area, Flats businesses have a great opportunity to save money while demonstrating excellence in green retrofits and renewable energy. The Flats plays a vital role in Vancouver as a place of experimentation and innovation for startups. It is one of the few areas in the city where there is a real opportunity to provide low-cost spaces for startups, as well as access to demonstration spaces and R&D programs. The Vancouver Economic Commission is working in partnership with the City of Vancouver to develop a long-range economic strategy and local area plan for the Flats. This work will set the policy context for future development in the Flats, as well as earmark future infrastructure and public realm needs. One of the central goals of the Flats economic strategy is to protect, enhance, and intensify industrial activity in the Flats. Over the past 2 years, we’ve heard from dozens of businesses that are struggling to find industrial facilities in the Flats that suit their spatial needs. These requests are helping shape the economic strategy for the Flats, so if you have additional spatial needs information, please enter it in our Space Needs Form. What does it mean to be the greenest place to work in the world? Over the past 2 years, the local business and non-profit community, student groups, and peers from other cities have been helping us answer this question from many different perspectives. These insights are helping shape the economic strategy for the Flats, so if you have additional input on what it means to be the greenest place to work in the world, please Share Your Vision with us. The Flats Climate Action Program in partnership with ClimateSmart, generously supported by the Vancouver Foundation and BC Hydro. The Upcycle Vancouver Project in partnership with Habitat for Humanity, Projects in Place Society, Basic Design and the Museum of Vancouver, generously supported by the Vancouver Foundation and Partners for Places. Sign up for regular updates on projects, plans, and opportunities in the False Creek Flats.